In the beginning, there was Apple, starting in 1976. The IBM PC didn’t come along until 1981, and the Macintosh didn’t appear until 1984. Windows, a latecomer, didn’t make an appearance until November, 1985, and wasn’t really much of a commercial force until Windows 3.0 in 1990. But starting with Windows 3.0, the Mac world started to take notice. Sort of, in a vague way. In 1991, in response to growing consumer interest, Apple released an Apple IIe card, allowing the Macintosh LC family to run Apple IIe programs on a Mac. By 1994, Apple decided to try their previous trick with something other than an Apple operating system, and introduced the Power Macintosh 6100 DOS Compatible. This awkwardly named machine was a PowerPC-based Macintosh with an 80486 processor card capable of running MS-DOS and Windows 3.1 software, side by side with the Mac’s native System 7 or Mac OS 8 or 9. A few years later, in 1996, there was significant consumer demand for at least some sort of Windows compatibility on the Mac, and Insignia Solutions started marketing a less costly software emulation of a PC computer, SoftPC. This was a very impressive technical trick, as SoftPC was essentially a PowerPC-based program pretending to be an Intel-based computer, allowing the user to supply their own copy of Windows to install and run Microsoft Windows-based software. Insignia later bundled copies of Windows 3.0, Windows 95 and Windows 98 with their emulator. The result was slow -- one might even say painfully slow -- but you could, in fact, run Windows software directly on the Mac, with no expensive plug-in hardware. Then in 2006, Apple introduced Intel-based Macs. This new architecture was vastly different: Macs and Windows computers were now, for the first time, using the same kind of central processing unit (CPU), opening up new possibilities. Apple exploited this directly with Boot Camp, a methodology in which the boot hard drive is partitioned with a Windows-friendly volume that can then be set up with a copy of Windows. While still used, this has fallen out of favor as, first, Parallels introduced a software-based virtual PC environment and then, a bit later, VMware joined the Mac market with their own virtual environment. By 2013, running Windows on a Mac using either Parallels Desktop or VMware Fusion was so commonplace that the only real question left seems to be: which one is better? MacTech magazine, a magazine aimed at Mac developers, network managers, and hard-core Mac wonks, decided to answer that question with a 9,200 word report. They gave Washington Apple Pi Journal permission to mine their article mercilessly as long as we promised to mention their MacTech BootCamp conferences, which they hold around the country. See links to the original MacTech study and the MacTech BootCamp schedule under Resources at the end of the article. When Parallels first introduced their virtual environment, called Parallels Workstation, in 2006, virtual machines on the Mac seemed simple: Mac users wanted to run Windows. Specifically, Windows XP. It was possible, if you wanted to be strange, to install and run Windows 3.1 or 95 or some other flavor, but Windows XP was was the most common goal. A year later, when VMware Fusion stepped in to offer competition, the world was starting to get more complicated. By this time, running Windows XP seemed commonplace, and Mac users were experimenting with running Windows Server 2003, Windows Vista, and various flavors of Linux. Parallels and Fusion found themselves in a battle to see who could claim to offer the easiest, smoothest, most “Mac-like” experience of running decidedly Mac-unlike operating systems. This battle has grown more complex over the years with the introduction of Windows 7 and, most recently, Windows 8. MacTech decided to deal with this complexity by trying pretty much everything. They tested both Parallels Desktop 8.0 and VMware Fusion 5.0 -- the latest versions each -- with both Windows 7 and 8. They also tried running different versions of Mac OS X under each (yes, a Mac running Mac OS X running another copy of Mac OS X in a virtual environment). They also tested using a wide range of hardware: a 1.8 GHz MacBook Air 13-inch dual-core i5 processor, a 2.3 GHz MacBook Pro 15.4-inch quad-core i7 processor, a 2.7 GHz MacBook Pro with Retina 15-inch quad-core 17 processor, a 2.7GHz iMac 27-inch quad-core i5 processor, and a 3.2 GHz quad-core Mac Pro. All the Macs were running OS X 10.8.2. Technically, MacTech’s tests are classed as “benchmarking.” These tests were mostly automated tests designed to show differences in speed, or capacity, or some other quantifiable measure. The tests are not aimed at determining how easy it is to use Parallels or how the configuration options of Fusion compare or which company has the best tech support or anything else dealing with day-to-day usability. 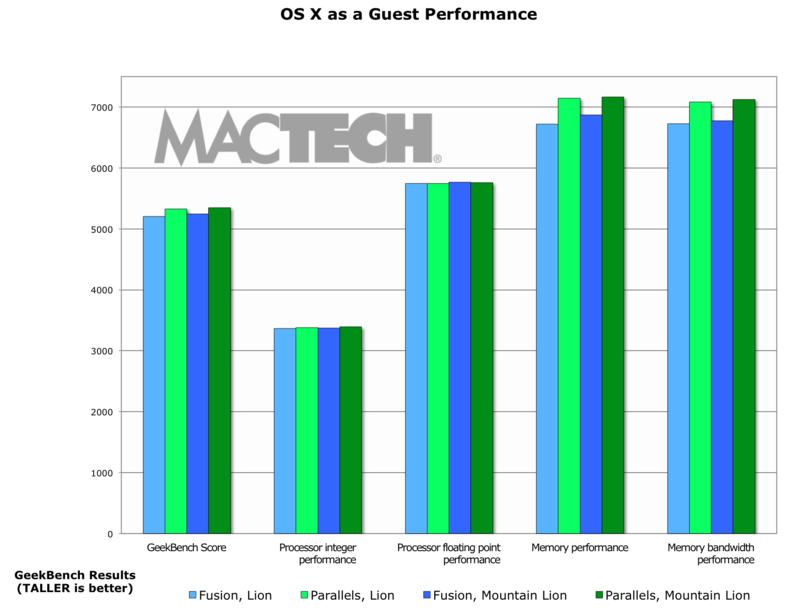 Using such benchmarks, Parallels came out the clear winner (see Figure 1). Fig. 1: Parallels won the vast majority of the general tests, games tests, and tests of 3D graphics. In about a quarter of the tests, Parallels and Fusion tied, and a tiny sliver of the tests were won by Fusion. Click on image for a larger version. 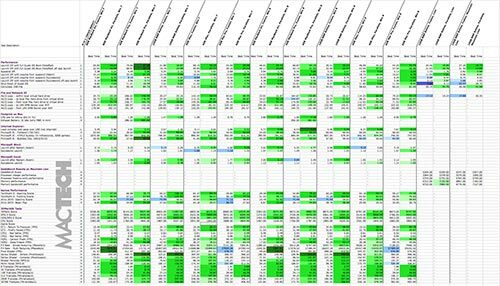 MacTech found the results so startling that they released a color-coded spreadsheet of the results, with Parallels wins marked in green and Fusion wins marked in blue; ties and tests not performed were left uncolored. 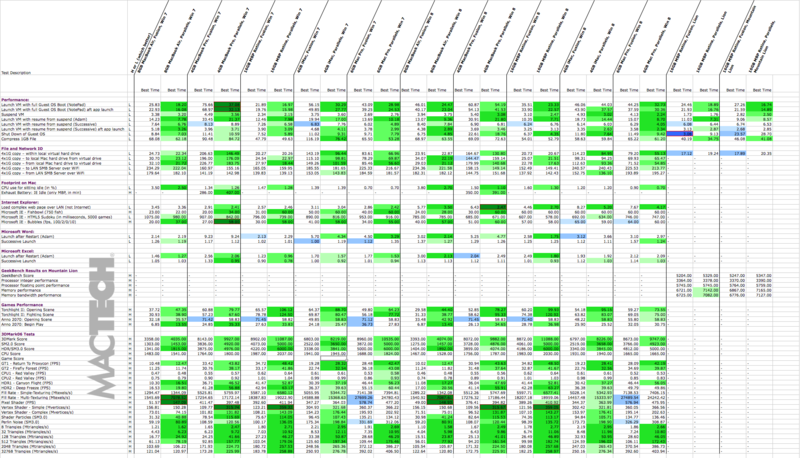 You can’t help but notice the spreadsheet is remarkably green (see Figure 2). Figure 2: Tests won by Parallels are marked in green on this spreadsheet; tests won by Fusion are marked in blue. Ties are left uncolored, as are blanks, indicating tests that were not run on a particular configuration. Click on image for a larger version. In all honesty, both packages do a more than adequate job of running Windows on any current Mac with a decent amount of memory. If you have a machine more than four years old or with less than 4 GB of memory, performance may be an issue, but for most users, except high-end gamers, things should be fine. MacTech didn’t stop with performance issues; they also discussed “footprint” (how much processing overhead the packages used) and battery tests. Footprint tests showed both Fusion and Parallels were remarkably civil and courteous packages; while Parallels won the tests, either could sit by idly and not interfere with anything else you might be doing. 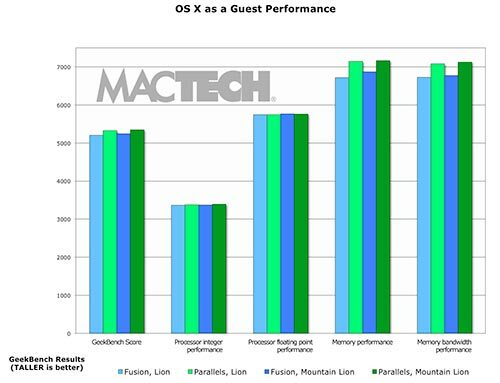 In battery tests, Parallels outdistanced Fusion in stretching out battery life, a critical consideration if you want your Mac laptop to also serve as your Windows laptop. For gamers, 3D graphics tests are of keen interest; when you are up to your armpits in orcs, battling your way through an evil forest, you don’t want slow graphics to put you at a competitive disadvantage when you are attacked by a grue. MacTech ran a ridiculous number of graphics tests, but they also took the time to simply play games the old fashion way: with a person at the keyboard. Here, performance issues were less of a problem than artifacts: flaws appeared on screen, little cracks in the painstakingly-rendered universes of the game. In Figure 3, playing the game Torchlight II, both Fusion and Parallels had problems with a panther appearing as a wire-frame rather than a fearsome feline creature. 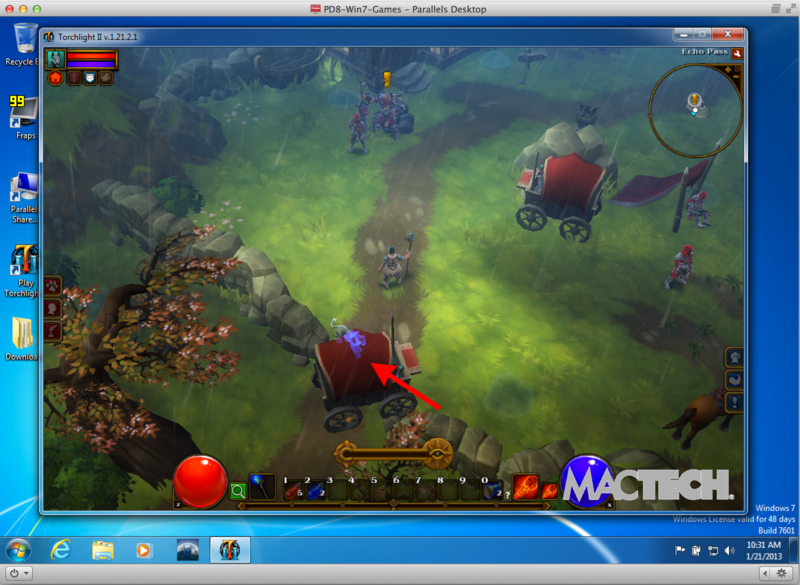 Figure 3: This screen shot shows Parallels playing Torchlight II, a fantasy game. A panther (indicated by the arrow) appears as a wire-frame rather than a texture-mapped feline carnivore. Fusion had the same problem, with the same game. Click on image for a larger version. Games, in fact, encompass a large section of the MacTech report, reinforcing the old adage that “Macs are for work, Windows for massively decreasing the productivity of the American workforce.” If you want to find out how Fusion and Parallels handle space marines, Formula 1 racing, and other essentials, refer to the full report. Generally speaking, gamers should consider Parallels, a MacBook Pro with Retina display and lots of memory, and the largest possible solid-state drive. True, almost everything works with a lesser machine, but the editors clearly had the most fun with this combination. One interesting issue is support for Retina display. The Windows world doesn’t have anything like the MacBook Pro with Retina display, and not just because this machine has an awkward name. Windows simply doesn’t understand the high-density character of the screen, so Parallels builds in support to transparently map Windows to something useful. Fusion relies on Windows built-in preferences, resulting in tiny screens about one-fourth the desired size. VMWare expects the user to manually change the size of text and other screen elements to 199% in order to make things readable. While this sounds easy to do, it also sounds less than elegant. The crispness of the Retina display shines in both Windows 7 and 8, on both Fusion (when adjusted) and Parallels. MacTech has a number of screen shots showing how nicely text and icons appear on the Retina display. On the other hand, Fusion does fall down because of its failure to size things appropriately under Windows 8. One set of screen shots shows the opening screen in Windows 8 looking quite tiny under Fusion, while Parallels displays the same screen as you would expect. As of this writing, there are few compelling reasons to run Windows 8 instead of Windows 7. But the MacTech did point out one advantage that both Fusion and Parallels have over Apple’s built-in Boot Camp technology: Boot Camp can’t run Windows 8. So if you absolutely, positively need to run Windows 8 on your Mac, you’ll need to use Fusion or Parallels. Both Fusion and Parallels have support for running Mac OS X 10.7 and OS X 10.8 as a virtual operating system. MacTech points out that this is not something most people would want to do; why would you run Mac OS X as a guest operating system of Mac OS X? But you can, so they tested both packages, and both performed adequately (see Figure 4). They suggest that this trick is probably of most use to developers, sysadmins and other strange creatures, testing out software builds or odd configurations. Figure 4: Running Lion and Mountain Lion under both Fusion and Parallels. As you can see, Parallels usually came out on top, but the differences are not that remarkable. Click on image for a larger version. I’ve used various flavors of Windows on Macs since the days of SoftPC, and have used Parallels since it was first released. For reasons that I won’t bother to explain, I regularly run Windows XP, Windows 7, Windows 8, Linux, and Chrome OS under Parallels, and have no particular problems with any of them. I’ve never tried to run Mac OS X under Parallels, as the installation process is a bit cumbersome and there is no good reason for me to try. MacTech didn’t cover Linux or Chrome OS, but I’m reasonably confident Fusion could handle both. One topic not covered in the MacTech article is the “disposable” nature of a virtual machine. Both Fusion and Parallels allow you to duplicate installed virtual machines, and this is a terrifically powerful tool for experimentation. Afraid the latest update patches may “break” something in Windows? Make a duplicate of your installation, then install the patches on the copy. If it works, fine. If it doesn’t work, throw the copy in the trash and empty the trash; your original, untouched installation is still perfectly usable. Trust me: thinking of Windows as disposable makes it much easier to put up with. And fun, as you can simply flush your frustrations away. 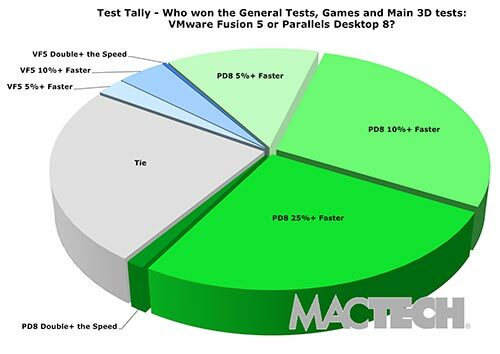 If you’ve ever wondered which was better, Fusion or Parallels, read the full MacTech article. If you’ve ever wondered how many ways you can torment an operating system, read the MacTech article. In particular, if you are a gamer and like playing Windows-based games, but would rather use your Mac, check out the MacTech article. It is as insightful as it is geeky.